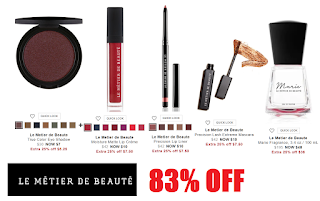 Huge 83% off Le Metier de Beaute Luxury Makeup Clearance Sale! Le Metier de Beaute Eyeshadow $5.25 (Reg $30), Lip Creme $7.50 (Reg $42), Lin Liner $7.50 (Reg $42), Mascara $7.50 (Reg $42), 3.4oz Fragrance $36 (Reg $195) + FREE OVERNIGHT SHIPPING. This was found by one of our readers who loves their products and was very excited to see this huge sale. This is a luxury makeup line and a steal at these prices!! Use coupon code NMQUICK at checkout for the free overnight shipping. Will show at checkout as "promotional shipping"